This afternoon I received a note from the Project Director of the Electrification Study, Karen Pitre. She concurs that the confidentiality agreement goes beyond what is necessary, and is preparing a revised version. I hope to be free to report on the dialog at the workshop. As I reported here recently, Toronto’s Medical Officer of Health, Dr. David McKeown, criticized the Metrolinx plans for substantial increased diesel train operation in the Weston corridor. Unacceptable lukemia risks are no longer predicted. Although local concentrations of some contaminants are predicted to rise, the MOH no longer feels that Metrolinx is underestimating the local outcomes. Similarly, acute health risks are predicted to rise, but the increase is not underestimated my Metrolinx. Notwithstanding the above, I remain concerned about the air quality impacts and increased health risks predicted for the immediately adjacent communities as a result of the proposed diesel expansion. In the “Information Clarification” Metrolinx has described potential air quality and health impact mitigation measures, including improvements to locomotive stock. While these mitigation measures would reduce emissions, it is not clear what level of reduction will be achieved in local ambient air concentrations of the respiratory irritants for which increased risk is predicted. As an alternative to electrification, other mitigation measures proposed by Metrolinx may, subject to demonstration, be acceptable. In its additional information Metrolinx also indicates that it is exploring alternatives to diesel train technology, including electrification. In my view, electrification is the option that most clearly addresses the air quality and health impacts predicted from the proposed project for populations adjacent to the line by ensuring that any emissions (due to electrical power generation) are regional in nature. Whether other measures proposed as part of a comprehensive mitigation strategy could reduce the predicted air quality and health impacts to an acceptable level remains to be demonstrated. Metrolinx not only misrepresented the MOH’s position, but blanketed the Weston Corridor with flyer reiterating the claims made on their website. What we know about air pollution in Toronto is that any proposal now should pass a very stringent test before it goes forward. This proposal has not passed that test in my view. The study, conducted by Metrolinx itself, indicates clearly that there will be impacts on air quality as well as health risks for those that live close to the line. Additional information on the rally can be found at the Star’s website. Metrolinx really needs to stop spinning this issue. They have created an electrification study, an advisory committee to recommend terms of reference for that study, and are about to have a “stakeholder consultation” where folks like me can contribute their input to the advisory committee. Electrification of the Lakeshore corridor is already part of the Premier’s announced plans for GO Transit. Why is Metrolinx trying so desperately to win a battle between the community and the Minister of the Environment? The Cumberland Street entrance of Bay Station re-opened recently at long last. Construction had been delayed by unexpected conflicting structures when the old entrance was demolished. It’s a nice entrance, as TTC buildings go, but something very odd shows up in the decor. 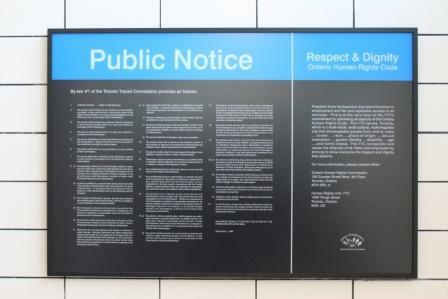 At the bottom of the entrance stairway, we find not a beautiful mural, not an historic account of Yorkville, not even ad advertising frame, but a copy of TTC Bylaw No. 1 at very large scale. This is no cardboard throwaway, but a metal sign built to last the ages. There’s only one tiny problem: the date. 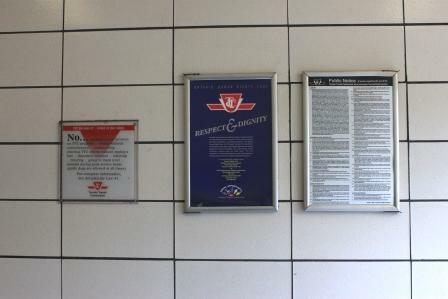 In fact, the TTC Bylaw was updated in 2009 as we can see by visiting the Bellair Street entrance. Here, we have the same info as on the Cumberland panel (the Human Rights statement and the Bylaw), plus a “here’s the bylaw stuff you really need” sign. However, this is the new bylaw from January 2009. I have been advised that the Cumberland panel will be replaced. Why did this happen in the first place? What is so important about the bylaw that it deserves pride of place on a wall that could have held a decoration appropriate to the neighbourhood? Why was a sign installed with text that was replaced 8 months earlier by a new and substantially revised bylaw? There is a move afoot to set up a website where people can report signage foul-ups. It may be hosted here, or maybe elsewhere. Once this is in place, I will publish the details. The war on transit riders continues with the Scotiabank marathon on Sunday, September 27. The TTC’s contributes the service change notices which tell readers almost nothing. For additional info, they refer people to the TTC website which has the same text as the printer notices. (Thanks to David Fisher for the photo.) All this really says is that there will be diversions and shuttle buses everywhere, but there’s no map. How even those who are familiar with the city can expect to find their way anywhere is a mystery. The first question one asks, of course, is “where is that marathon, anyhow”. For that you have to go to the marathon site itself. (One thing I will give them is that the map is at least accurate with streets, neighbourhoods and landmarks correctly named.) Street closures have their own set of notices. Meanwhile, as happens so often, The Beach will be completely closed to traffic east of Kingston Road. Alas this isn’t mentioned in any of the TTC’s public information. Why must this always be done by the transit afficionadoes and advocates rather than the people we pay to provide this service? One of the things I passionately believe, and one of the reasons I ran for elected office to begin with, was about public transit. Indeed, improving public transit to make Toronto a “World Class City” was part of Miller’s first, unsuccessful, bid for a Council seat in 1991. The next election, in 1994, brought Miller to the old Metro Council. Streetcar service will return to route 512 St. Clair on December 20, 2009. Streetcars will operate from St. Clair Station to Earlscourt Loop at Lansdowne, and buses will operate from Oakwood Loop to Keele (Gunn’s Loop). Buses will run in the curb lanes except for the stop eastbound at Oakwood. Service on the streetcar route will be improved relative to pre-bus operations (see detailed chart). Headways at all times are more frequent than the April 2007 streetcar schedules, and the widest headway is 10 minutes. That is operated only late evenings on weekends. Work on the Bathurst Street underpass at Dupont will be completed before December 20, and streetcars will operate from Roncesvalles Carhouse rather than Hillcrest. The service planned for St. Clair is clearly an improvement both in frequency and speed over that which operated on the route before it was rebuilt. The new schedules go into effect during the winter months, an ideal time to show off improved service quality. With luck, the traffic signals will actually speed streetcars across the route rather than contributing substantial delays. This is a real test of the TTC’s and the City’s desire to show that transit priority and all of the disruption on St. Clair are worth the effort. The TTC’s Capital Budget Report is now available online. I will not comment on this in detail until after the staff presentation at the Commission meeting on September 24. Of particular note, although it is not mentioned explicitly in the Capital Budget Report, the TTC now has an “SRT Conversion and Expansion project” that is mentioned on Page 6 of the July Chief General Manager’s Report. Presumably there will be more information about this at Thursday’s meeting. Such a change has long been rumoured by staff at the various community EA meetings, but we have never actually seen an LRT, as opposed to ICTS, design for the RT and its Malvern extension. The change in average fare revenue is 2.32, not 3, cents per rider due both to higher pass sales and greater use of concession fares (children, students, seniors) (page 3). Yearend revenue shortfall from fares will lie between $15- and $19-million depending on ridership results through the fall. Yearend revenue from advertising and other income (mainly interest) will be $3.6-million below budget. Planned service reductions ($1.9-million). It is unclear whether these are reductions still to come, or if this is the saving versus budget of cuts imposed by availability problems with the bus fleet. Some service improvements planned for fall 2009 will be deferred until mid-2010 (no list is given). Overtime will be curtailed. The effect on service availability is not addressed, but we do know that there were problems with fielding all service late in 2008 due to similar actions. There will be a comprehensive review of hiring and training for operators. This is intended to address a surge in retirements caused by demographics of the operator workforce. All discretionary expenses in departments will be reviewed. Page 6 mentions “the SRT Conversion and Expansion project”. Although this is not explicitly mentioned in the Capital Budget report, we are about to see the TTC announce the conversion of the SRT to LRT technology. This has long been rumoured, and finally has shown up in print. The TTC recently presented details of its preferred location and proposed layout for a new carhouse in the Port Lands. Of several sites considered, the now-vacant land at the south-east corner of Leslie and Lake Shore wins out. The land is close to Queen Street (only a few blocks to the north), and as vacant land can be easily redeveloped. The presentation linked from the project’s website gives an overview of the site selection process as well as drawings of the new carhouse. The big issue now will be funding. Over the past year, the debate centred on getting and paying for 204 new streetcars, but nobody talked about the carhouse they would need. That’s one of the outstanding issues going into the capital budget planning for coming years. One item of great interest is that the drawing on page 15 clearly states that the yard capacity is 100 cars, plus 36 cars inside the carhouse. The long-term status of Roncesvalles and Russell is undecided at this point. In the short term, they will be needed to house the existing CLRV/ALRV fleet. However, the proposed new carhouse is clearly too small, and the TTC must intend to use another site, possibly the nearby Russell Yard, as a spillover location. Updated September 22 at 9:50 pm: According to this evening’s Global news, the TTC will pull the offending maps tonight from all stations. Now may be your last chance to photograph your favourite blunder. Mind you, considering how fast the TTC is at taking down out-of-date notices, I suspect the “bad” maps will be around for awhile. It will also be intriguing to see if, when the new maps are installed, they actually do update all of them in every station. I found four of elderly vintage without looking very hard yesterday. Meanwhile, the Star managed to publish an annotated version of the St. Andrew map which shows City Hall where Osgoode Hall actually is, and the CN Tower at the corner of John and Front, north of the rail corridor. I suppose a paper with its offices in the 905 can’t be expected to know much about downtown Toronto any more. Finally, I strongly urge that the TTC circulate the new maps for comment to ward Councillors’ offices who might actually know where things are in their respective neighbourhoods. Even better, as some have suggested in the comments here, put them online so that the vastly better-informed transit amateurs can help out with the project.